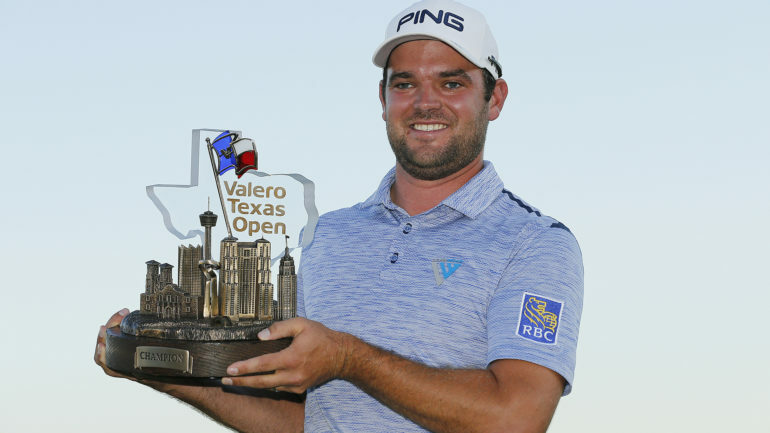 SAN ANTONIO – Canadian Corey Conners claimed his first PGA Tour victory and earned an invite to the Masters on Sunday, winning the Valero Texas Open less than a week after qualifying. Conners only entered the tournament field Monday, and he’s the first golfer to win on the PGA Tour after qualifying on a Monday in nine years. He made three birdies in the final five holes, shooting a 6-under 66. He was 20-under for the tournament, winning by two shots over Charley Hoffman. Next stop for Conners: Augusta, Georgia, for next week’s Masters. Hoffman, the 2016 Texas Open winner, shot 67 for 18-under on the weekend. Mackenzie Hughes (73) of Dundas, Ont., and Adam Svensson (70) of Surrey, B.C., tied for 42nd at 5 under. Nick Taylor (72) of Abbotsford, B.C., tied for 52nd at 4 under. It was a wild round for Conners, a native of Listowel, Ont., who had not won on any of the PGA Tour’s affiliated circuits. He had 10 birdies and four pars that sandwiched four consecutive bogeys on the front nine. He had a one-stroke lead when he rammed home a 34-foot birdie putt at No. 12, and stayed a stroke up with a tap-in birdie at the 14th. It was only a matter of time! @coreyconners, your latest Canuck to win on the #PGATOUR with a victory @valerotxopen! Canada and hometown Listowel couldn’t be more proud ???? – Next stop, @themasters!